China Third-party online payment market had a total transaction value of RMB 4.65 trillion in Q2 2016, with an increase of 6.5% QoQ according to Analysis. Alipay continued to dominate China’s third-party online payment market by total transaction value with 43.39% market share, followed by Tenpay (16.95%) and UnionPay Merchant Services (15.44%). The total transactions of China’s third-party mobile payment market exceeded RMB 7.5 trillion in Q2 2016, an increase of 25.68% QoQ. The total transactions in the first half of 2016 reached RMB 13.48 trillion. Alipay led China’s third-party mobile payment market with 55.4% market share, followed by Tenpay (32.1%) and Lakala (4.4%). 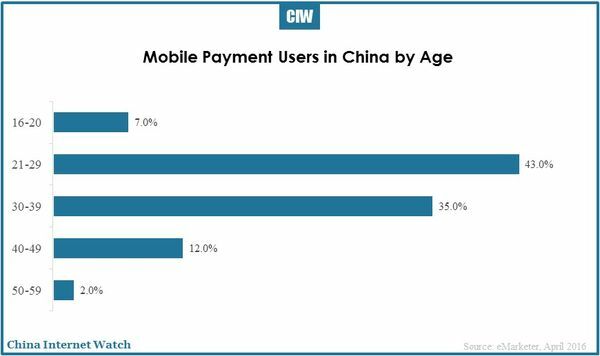 China users in 21 to 29 age group from the first-tier and the second-tier cities are the main mobile payment users, accounting for 43%.